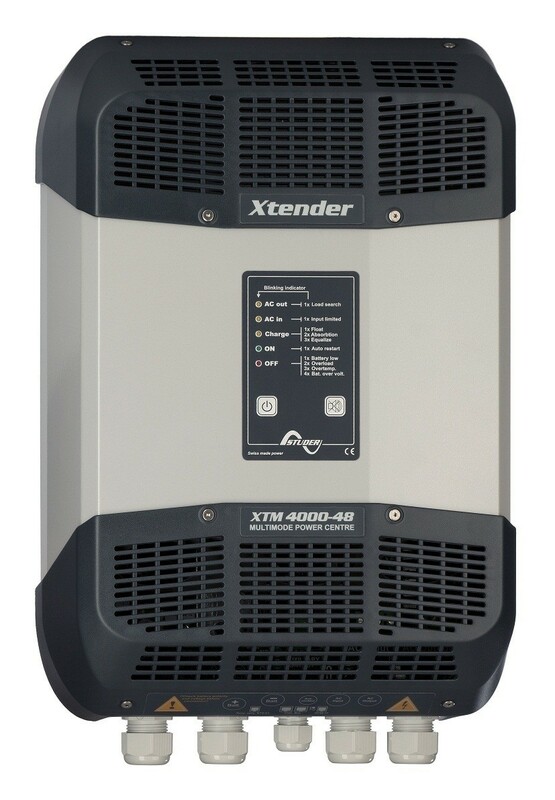 The Xtender series provides unmatched freedom of use due to its many functions. In a basic application it offers a total package : the functions of inverter, battery charger, transfer system and assistance to the source. These functions can be combined and controlled in a totally automatic way for exceptional ease and optimal management of available energy. The Xtender is equipped with a command entry and 2 configurable auxiliary contacts. This allows automatic control of a genset or a load shedding when the battery voltage is too low. This flexibility makes it possible to implement special functionalities necessary for a good energy management in standalone power systems. Perfect management and limitation of AC sources. Power shaving of consumption peaks. Active filtering of load steps on a genset. Automatic protection of sources against overload. Parallel and three-phase setting, up to 9 units (72kW). Display, programming and data logging via optional remote control. RS-232 communication for remote monitoring.